Once I was held prisoner in my room for 10 weeks. Preterm labor demanded bedrest if I wanted to give my unborn babies a chance. I lived in fear of losing them. I also lived in fear of crows. Almost every day of my bedrest crows came to haunt me. They curled their talons and straightened their black cloaks on the bare winter branches outside my window. They stared in my room with sinister eyes and cawed menacingly. I trembled. There was no roadkill in my room for them to eat. Whose death were they waiting for? Were they circling over the twins I was desperately trying to grow inside my huge belly? Did they think my babies weren’t going to make it? Did they know something I didn’t? One day I couldn’t take it anymore. I untangled myself from the contraction monitor, subcutaneous terbutaline pump, long white compression socks, and twisted blankets and heaved myself out of bed. I punched at the window with one hand and guarded my babies with the other. “Go away!” I shouted tearfully. “Get out!” They laughed with disdain and flew to the next tree. The neighbor’s dog barked. My heart raced. I knew they’d be back. My babies were born and they flourished. 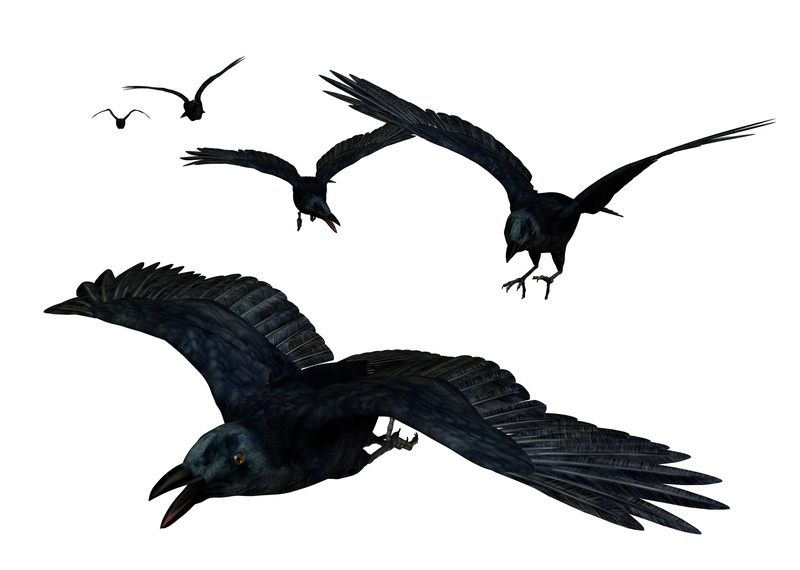 But I couldn’t shake the fear of death whenever I saw crows. I didn’t want to see the flattened carcass or droopy pink baby animal near their beaks. I didn’t want to hear their caws and remember the weeks they mocked me. When we moved to Georgia last year I started running in the woods. I often shared my runs with deer, ducks, sparrows, and happy dogs. Except for the lonely day I was ambushed by crows. When I emerged from the protective canopy of the forest they were waiting for me in a parking lot, spread across five scraggly pine trees. One taunted me. Two of his brothers joined in. Another dropped from the tree and onto my path. I was terrified. With all my spiritual warfare training I shook my fist at them and shouted, “In the name of Jesus, get away from me! I belong to Jesus Christ!” The whole crow family laughed at me and stayed put. They followed me. 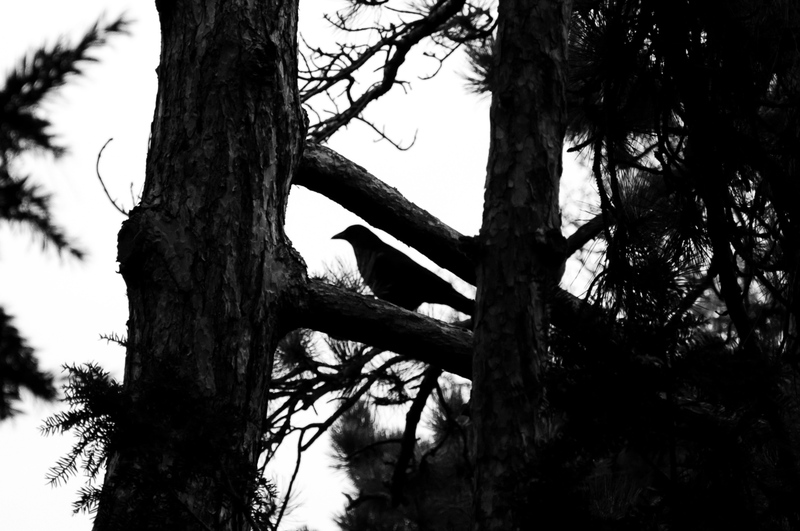 A half-mile later, at the top of a hill, all ten crows landed in a nearby tree. They watched me. I thought of Hitchcock’s Birds and Poe’s Raven. With less courage I said, “I belong to Jesus Christ” the same way I say, “excuse me” when walking back to my seat in a crowded movie theater. They cawed in derision and hopped over to the next grove of trees on my route. I beat my personal record running home. That evening when I went out to grill on the back porch, forty crows flew over my house and landed intentionally into the thick trees on the edge of my yard. They watched me. I could hardly breathe. Recently I was blindsided by a deep loss. All the ways I knew how to deal with it didn’t help. God felt far. I set out for a run to temporarily forget about it. A crow called out to me before I put in my headphones. I looked up at the roof, too tired to panic. We looked at each other. He stuck out his beak and chest regally. Suddenly everything was clear. The crow wasn’t an enemy of mine, or Jesus Christ’s. He wasn’t there to heckle or torment me. He wasn’t a harbinger of death from Satan. Maybe he was a messenger. A messenger from God saying death was near. I always wanted to have children, but wasn’t prepared for the complete destruction that mothering brought to my identity. Those crows out the window during my bedrest were sent to show me that the childless, slender, working-for-a-paycheck version of me was going to die. A new me was coming. They would watch over that death and clean it up for me. I think God sent them to help me, and I missed it. I always wanted to be obedient to God with a “here I am, send me” attitude. But when He led our family to Georgia I struggled. Everything was exponentially harder than I expected. Those crows in the pine trees were sent to help me see that the well-connected, comfortable, Illinois version of me was going to die. A new me was coming. The crows would take care of that death, too. I think God sent them to comfort me, and I missed it. The loss I was grieving still felt raw. The old ways of processing and coping were not going to work. This one crow was hoping I would let that morose, dramatic, defeated version of me die. A new me was coming. I think God sent him to teach me, and I didn’t want to miss it. I stood silent on my sidewalk, holding this brand new understanding of God’s love. His love would not spare me many deaths. He was near and he wanted to make me new. It felt too big to run with. It felt too hopeful to leave behind. I looked up at the crow again. I recognized his sender. I didn’t feel threatened. I felt safe. I hoped the crow, and God, would join me on my run. How do you feel about death? Does it fascinate or disgust you? Terrify or appeal to you? How does death shape your faith? You are not the person you were 10 years ago, 5 years ago, 2 years ago. How have you handled the deaths of your own self? How do you know when a new thing, a new you, is ready to emerge? Does God have to wrench the old away from you with a dramatic event? Or do you surrender yourself with trembling hands? Halloween Idea: When you see skeletons, coffins, and gravestones in front yards, drug stores, and on TV consider asking God, “Is there something in me that needs to die, Lord? Am I holding on to parts of myself that need to go?” Please make time to hear an answer. Consider sharing your thoughts with a good friend. So he went and did according to the word of the Lord. He went and lived by the brook Cherith that is east of the Jordan. Before this epiphany, I always saw crows as Bullies and associated them with shame. I’ve encountered God often while running in the woods, often I’m Running Away from him.